I read this article and found it very interesting, thought it might be something for you. The article is called The State Of State Finances and is located at https://archive.indiaspend.com/viznomics/the-state-of-state-finances-2-91307. Maharashtra has 85 State PSUs. Their combined revenue is Rs 40,873 crore, which represents just under 5% of the state’s GDP. Some 199,000 people worked in these enterprises which turned in a cumulative loss of Rs 1,360 crore. Accumulated losses are pegged at Rs 8,539 crore. Interestingly, of these 85 State PSUs, 23 are classified as non-working and 3 have been under liquidation for between 17 and 24 years. There is however a lack of a unified view on the state’s balance sheet. 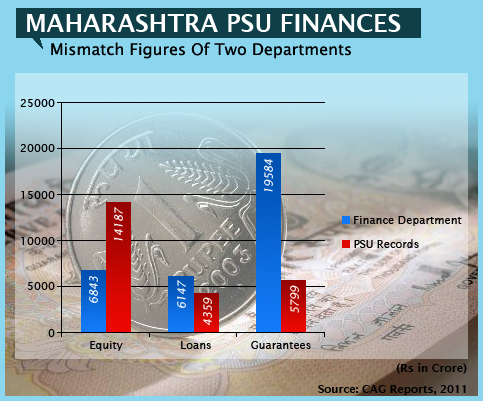 The CAG report says the records of the state PSUs and state government do not tally. Here’s an insight into the equity, loans and guarantees.